Boutique hostel at a backpackers price. 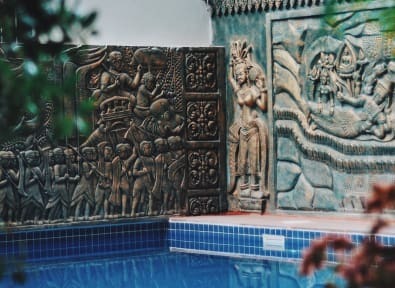 Bokre Angkor Hostel provides comfortable accommodations at affordable prices with rooms well-suited for solo travelers, couples, families, groups, and students. Complimentary pick up service is provided from the airport or bus station between the hours of 6:00AM-9:00PM. Please note that any pick up before or after will have a charge per tuk tuk; $5.00 from the airport or $2.00 from the bus station. Conveniently located in the heart of Siem Reap, our property is nestled on a lovely and peaceful street away from the bustling downtown area. We are a quick 15 minute walk to the famous Pub Street/ Night Markets. We are also a 15-minute ride to well-known Angkor Archaeological Temples as well as the Siem Reap International Airport. Surrounded by an array of restaurants, cafes, local markets, super markets, and convenience stores, everything you may need is right outside your door. We pride ourselves in creating a relaxing environment, and a home away from home feeling. You will enjoy comfortable rooms, great facilities, and friendly services. We are not a party hostel! Our restaurant serves healthy, locally sourced foods with indoor/outdoor dining options. We also have a full bar serving both alcoholic and nonalcoholic drinks. Enjoy our outdoor jet pool, tropical garden, business center, and free high-speed WiFi throughout our hostel. Our 24 hr front desk staff are more than happy to help you with any information that you may need, and strive to make every guest simply have the best visit to Siem Reap. This property was newly renovated in late 2017, and officially opened in January 2018 by new owners. The business is owned and ran by a small Cambodian family. Amazing stay! Everything is very clean, the stadf is really helpful and very polite. Special thanks to Mr. John who made sure I managed to catch my bus, overall amazing! Bokre Angkor Hostel was the best hostel we stayed in during our trip in Cambodja. The staff is suuuuper friendly, they help you with anything. The pool was amazing and very clean. Bedroom also very clean and everything worked properly. Breakfast was delicious! We would recommend to anyone!!! This hostel is nice, has a hotel vibe, clean rooms. The staff is very friendly, the pool nice to cool off. Mattress in the private room is really hard. The lunch and diner food is really good. Breakfast is okay. Prices are very reasonable. The drink prices are to expensive. The speed at which they make shakes or ice coffee is much to slow (30 minute wait!). The morning shift in the restaurant is understaffed, when there are over 4 people they can’t handle it. The waitress was stressed.